The prospect of furnishing a college dorm room can result in a lengthy shopping list. Nix the stressful spending as you prepare for a new semester, and instead try some fun DIY projects. These bloggers’ DIY décor ideas offer inspiration for ways to turn household items into inexpensive, one-of-a-kind accent pieces. Learn ahead of time what items are already furnished in your dorm room. Look over your school’s website or contact a college advisor to find out what type of hanging hardware is allowed and what kinds of appliances you can bring. Reach out to roommates so you don’t duplicate larger pieces like refrigerators and futons. Visualize how much closet and drawer space you will have so you don’t purchase unnecessary storage bins or shelves. Be careful about sticking posters or pictures to the wall. Most schools charge a fee for chipped paint. Before buying, always ask around among friends or family to offer to take unwanted furniture or appliances off their hands. Skip pricey décor altogether. By the time you are done with college—possibly even the school year—you’ll be ready for new furniture and accessories. All the excitement of a new space makes it tempting, but there’s no need to blow your savings. Try trolling these sites for inexpensive furniture and décor instead—craigslist, Bed Bath & Beyond, Target, or Ikea. If you’re against downsizing your personal shoe collection to suit dorm life, then Creature Comforts’ Simple DIY Shoe Storage is perfect for keeping your heels from getting tangled up, and you will never waste time trying to find the right pair for the day. These pretty boxes will also save closet space because they will look decorative and neat stacked under your bed or on an exposed shelf. You can use old shoeboxes and neglected wrapping paper, scrapbook sheets, or even old magazines and newspapers to get this effect. Clothing hangers somehow seem to accumulate through the years. Turn one hanger into a jewelry rack with Dwell Beautiful’s DIY Wood Hanger Necklace Holder tutorial. Display your statement necklaces for an aesthetic appeal and keep your jewelry organized. It’s easy to keep this piece ligt enough to hang on a wall, so a small dorm-friendly Command hook would do the trick. Whether you already have an old clock at home or you can find an inexpensive, plain clock at the store, you won’t need to spend a lot of money on finding something cute with this DIY Wrapping Paper Clock courtesy of Henry Happened. Since it’s especially easy to customize, this decorative piece can be made to fit any style and color scheme. Never underestimate the power of a simple painted canvas. Once you have some blank canvases and paint, you can create as many works of art as you wish to quickly brighten up your dorm room walls. Use two Command hooks to place the corners of the canvas on, and you should have no problem hanging your paintings. A Side of Sweet provides a creative idea for Pretty Painted Wall Art. Add some personal style to your dorm room with a bold print of your favorite designs. Patchwork Cactus’ DIY Stamped Fabric tutorial requires few supplies and can be customized depending on your favorite shapes and colors. Try stamping a plain pillowcase you already own to spruce up your bedding for almost no cost. 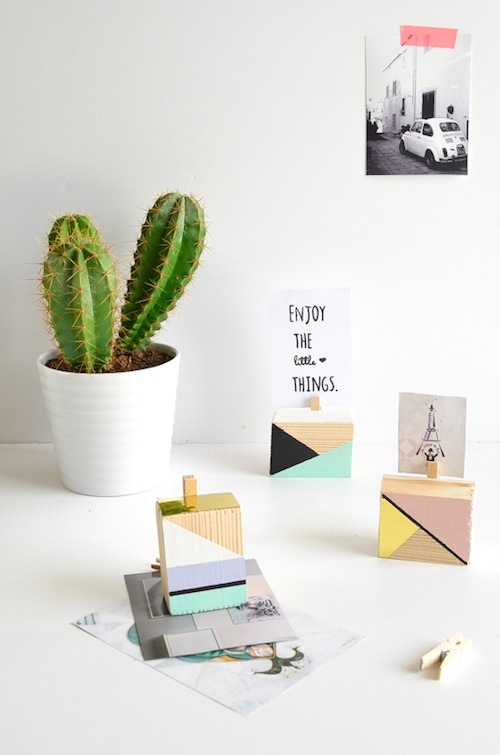 Display your favorite quotes and photos on your desktop or dresser with Passion Shake’s DIY Geometric Picture Holders. If you have blocks of wood and clothespins at home, then this craft is much cheaper and more fun than buying overpriced picture frames. The clothespins make it extra easy to swap out pictures too! This surprisingly easy Pendant Tassle Light from A Subtle Revelry uses poster board to create a boutique style lamp. This project may require some creativity as far as how to assemble it in a dorm room with the school’s regulations, but the design could still be used as a lightweight decorative hanging—imagine one of these suspended underneath a lofted bunk bed or hanging from a tiled ceiling. Even if you have used the same mirror your entire life, with The Homesteady’s DIY Quick Gold Leaf Mirror Upgrade, there’s no need to purchase a new one for your dorm. The metallic gold trim makes a statement and will add an easy touch of glam to an otherwise dull dorm room. One of the most important things to remember when decorating your dorm is to make it feel like home. Make a statement—and enjoy a few pieces of home—with this DIY Inspiration + Mood Board from Jillianastasia to combine all of your favorite keepsakes and pictures on an old frame. Gather up some Ping-Pong balls for this much-needed dorm accessory. Hanging lights will make your dorm cozy so you don’t have to resort to overhead fluorescent lighting all the time. This DIY Ping-Pong Lighting Tutorial from Heart Handmade UK is a creative way to upgrade a string of classic twinkle lights. Look to the kitchen for tabletop accessory inspiration. In general, mason jars and mugs are often wonderful pieces for displaying flowers or keeping pens and pencils. Here, The Lovely Drawer shows how to make DIY Japanese Printed Bowls for storing jewelry in a stylish way. Turn a basic cushion or pillowcase into a pretty, one-of-a-kind piece with this classic pattern. The DIY Polka Dot Cushion from Rock My Style can be completed in a few simple steps with just a cork, fabric paint and cushion cover. Use this item on your bed or as an extra place to sit on the floor. My Fabuless Life’s Summer Coffee Table Tray DIY transforms a table surface into a sophisticated, expensive-looking space. By using tools found around the house, this tray will make your room feel more like an upscale apartment than a college dorm—without breaking the bank.